Lack of water management and limited access to data risk hindering Myanmar’s economic growth, making water security a top priority of the new government. On Apr. 6, 2013, Nadia Sharmeen, a crime reporter, was assigned to cover a rally organised by Hefazat-e-Islam, an association of fundamentalist Islamic groups in Bangladesh whose demands included a call to revoke the proposed National Women Development Policy. An exiled leader of the Rohingyas, a persecuted Muslim minority in Myanmar, is raising the alarm from his London office about the fate of his community. He fears “ethnocide to remove all references to the Rohingyas” if the first census in 30 years goes ahead in the Southeast Asian nation. A draft law being readied for parliament that seeks to offer lesbian, gay, bisexual, transgender, intersex and queer (LGBTIQ) couples the same legal rights as heterosexual couples could make Thailand the first country in Southeast Asia to legalise gay marriage. As the situation in Myanmar deteriorates, thousands of Rohingyas have fled the country in search of a safe haven. Myanmar’s President Thein Sein on Monday became the first leader of that country in almost a half-century to pay a call on the White House, a visit that has simultaneously highlighted a series of monumental changes seen in Myanmar in recent years as well as a reforms process that many are warning may have stalled. A long-awaited official report on last year’s sectarian violence in western Myanmar is being heavily disparaged by human rights and advocacy groups here, who say a government-backed commission has placed undue emphasis on strengthening security while almost completely ignoring issues of discrimination and accountability. Nearly 20 of the world’s largest creditor countries have announced that they would be cutting nearly half of Myanmar’s total foreign debt, worth some six billion dollars. The International Finance Corporation (IFC), the World Bank Group arm that focuses on the private sector, announced Wednesday that it would be backing a new microfinance institution in Myanmar aimed at reaching 200,000 people by 2020. Worried over the possibility of further escalation of armed conflict in Myanmar, activists here are calling on Washington to take stronger action to condemn state forces for aerial bombardment of ethnic Kachin rebels and civilians in the country’s north, which some say constitutes crimes against humanity. As Thailand braces itself to combat drug-resistant malaria, a spread of small, nondescript buildings scattered close to corn and rice fields along its hilly, western border are being cast into a bigger, international role. With a new surge in sectarian violence in western Myanmar estimated to have killed more than a hundred people in recent days, top officials in the United Nations are criticising the Myanmar government for dragging its feet on addressing the “root cause” of a conflict that could disrupt the delicate reforms process underway in the country. 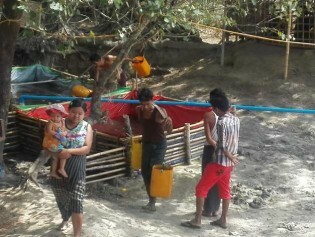 Following sectarian violence in the western Myanmar state of Rakhine in June, human rights researchers are now warning that the government appears to be attempting to permanently house parts of the stateless Muslim-minority Rohingya in “temporary” refugee camps, segregating them from the rest of the population. Speaking on Tuesday at her first public address in the United States, Myanmar’s opposition leader, Aung San Suu Kyi, said that she supported the lifting of the last remaining U.S. economic sanctions on her country, but also warned that all remaining political prisoners need to be released. Myanmar, also known as Burma, has taken important steps towards democracy and greater respect for human rights during the last months with one exception, activists say – the situation for the Rohingya minority, which has faced an outburst of violent attacks this summer. After decades of grinding poverty under successive military dictatorships, Myanmar’s rice farmers have a chance at a better future through rural reforms ushered in by the country’s quasi-civilian government. Microfinance is at the root of it. Following on a May announcement, the U.S. government on Wednesday moved to implement its most significant rollback in longstanding sanctions on Burma, also known as Myanmar. The outbreak over the past week of communal violence between Buddhists and Muslims in Rakhine State seriously threatens the ongoing reform process in Myanmar, according to experts here. As campaigning for the Apr. 1 poll in Burma (also Myanmar) gets into full-swing, there are misgivings on whether the National League for Democracy (NLD) party of pro-democracy leader Aung San Suu Kyi will get a fair deal. Extraordinary political changes in the year since former army general Thein Sein came to power in Myanmar have prompted European powers to ease restrictions on the isolated nation, raising questions whether such rewards are too little or too much.